c the inclusion of Article 2(3) of the LDC, establishing that such prohibition also applies when dominance derives from the law. The NMCC adopted three fining decisions in 2017 for abuse of a dominant position, namely, Renfe Operadora (discriminatory practices),9 Nokia (margin squeeze)10 and Criadores de Caballos 2 (discriminatory practices).11 These cases led to the imposition of fines totalling €17.06 million. e in 2012, the NMCC adopted six fining decisions, which imposed fines amounting to €162.4 million, including several key decisions such as Transporte Televisión16 (margin squeeze), Endesa Instalación17 (leveraging and exploitation) and Mensajes Cortos18 (excessive pricing). The increase in the number and level of fines in 2017, compared with recent years, is likely because of the specific circumstances of the cases at hand and not because of a general trend of an increase of fines in abuse of dominant position cases. In an attempt to clarify the conditions of the notion of ‘abuse’, in 2006, the TS established that the decisive element in identifying an abuse is not the intention of the dominant undertaking, but rather the objectively illegal nature of its conduct.35 It was stated, for instance, that the willingness to prevent an operator from entering the market may not be objectionable in itself if implemented through legitimate means. However, although such a statement places the emphasis on objective considerations, it does not definitively rule out the need to take intent into account. In this context, it has been noted that even if this test does not formally require the proof of anticompetitive effects, in practice, it is very similar to an effects-based approach.36 It has been argued that today, Article 2 of the LDC leaves no room for per se abuses and, therefore, a given conduct may only be deemed contrary to such a provision if it is liable to give rise to anticompetitive effects, even if these effects do not actually materialise in a specific case.37 Recent NMCC decisions confirm this shift towards an effects-based approach.38 This said, the relevance of effects and intent in the assessment of potentially abusive conduct must logically be analysed by reference to the specific forms of abuse. In its Altadis judgment on predatory pricing,41 drawing on the criteria set out in Akzo and Tetra Pak, the TS held that when prices are set below average variable costs, they are presumed to be abusive, while if they are set at a level above average variable costs but below average total costs, they are only deemed abusive if they constitute part of a strategy to exclude competitors. The TS concluded that the decisive element defining predation was the intention to eliminate a competitor. While in the former case such intention would be presumed, in the latter case it must be proven. In Transporte Televisión,42 the NMCC fined Abertis Telecom for having abusively squeezed the margin between the wholesale prices at which access was granted to digital terrestrial television (DTT) transmission centres and the retail prices for DTT signal transport services. The NMCC held that Abertis had control over essential inputs and, after applying the ‘as-efficient competitor test’, concluded that such conduct constituted abuse of a dominant position, insofar as it hindered the entry of competitors in the DTT signal transport and distribution market. The NMCC noted that entry in the retail market was both technically viable and economically possible, and thus the lack of effective competitors could only be the result of the pricing policy adopted by Abertis. The NMCC decision in Iberia47 constitutes a key precedent on loyalty rebates. This case concerned a target rebate scheme whereby travel agencies benefited from rebates only if their purchases had increased in comparison with their purchases in the previous year. These rebates were analysed in light of the criteria set out in Hoffmann La Roche and Michelin and were deemed to be abusive insofar as they gave rise to harm to consumers and competitors. Regarding refusal to deal, it has been noted that the NMCC has generally been more willing to consider such conduct abusive when the company requesting supply was already a client or competitor of the dominant undertaking and when such refusal constituted an absolute refusal to deal.54 In McLane/Tabacalera, the NMCC concluded that by refusing to supply certain products, Tabacalera abused its dominant position since the products in question were indispensable to compete in the wholesale distribution market.55 Tabacalera was deemed to have attempted to foreclose potential competition to protect its position in the market, which had recently been liberalised. In an older case, Iasist/3M,56 a refusal to license case, the NMCC considered such conduct abusive despite the lack of indispensability, given the ‘excessive influence’ that this conduct could have on the competitive conditions of the market in which the complainant operated. The key provisions concerning sanctions are Articles 61 to 70 of the LDC. As a general rule, abuse of a dominant position is considered a serious infringement punishable with a fine of up to 5 per cent of the total turnover of the infringing undertaking in the immediately preceding business year. However, when abuse of a dominant position is committed by an undertaking operating in a recently liberalised market, and such an undertaking has a market share near monopoly or it enjoys special or exclusive rights, it will be considered a very serious infringement, and the NMCC may levy fines of up to 10 per cent of such turnover. The aggravating and mitigating circumstances provided for in the LDC are very similar to those enshrined in the 2006 Commission Fining Guidelines. Certain differences, however, exist as regards the regulation of mitigating factors: the LDC explicitly provides that the NMCC may reduce a fine due to the adoption of actions intended to repair the damage; and according to the Fining Guidelines, the Commission may reduce a fine where the undertaking provides evidence that the infringement has been committed as a result of negligence and where the anticompetitive conduct has been authorised or encouraged by public authorities or legislation. The NMCC may also impose fines of up to €60,000 on the legal representatives and managers of the infringing undertakings and periodic penalty payments (PPPs) of up to €12,000 per day under specific circumstances. Moreover, the NMCC may adopt interim measures, either ex officio or at the request of one of the parties, at any moment throughout the proceedings. These measures may consist of cease-and-desist orders or orders imposing specific obligations to prevent potential damage; or securities to ensure the availability of funds to face future damages claims. The conditions for the adoption of interim measures are the existence of fumus boni iuris and periculum in mora. Structural remedies may only be imposed in the absence of equally effective behavioural remedies or when these remedies would be more onerous for the undertaking in question than the imposition of structural remedies. The NMCC has not yet imposed this type of remedy in its Article 2 of the LDC and Article 102 of the TFEU enforcement. The NMCC abuse of a dominant position infringement proceedings are regulated in Chapters I and II, Title IV of the LDC, as well as in Chapters I and II, Title II of the RDC. These proceedings are divided into two phases, before two different bodies within the NMCC: the Competition Directorate (CD), in charge of the investigation of the case and of making proposals to the Council; and the Council of the NMCC (CNMCC), with adjudicatory functions and power to issue sanctions. Proceedings may be initiated ex officio by the CD, on its own initiative or on that of the CNMCC; or by a complaint made by any natural or legal person. In practice, investigations are commonly triggered either way. Once the CD receives information concerning a potential infringement, it may conduct a preliminary investigation (prior to the opening of formal proceedings) to determine whether it may open such proceedings. As a result, the CD may carry out inspections. Although at this stage the parties’ procedural guarantees are limited, the NMCC must abide by fundamental rights standards (e.g., impossibility to access premises without consent or a court order) and must respect legal professional privilege. The CNMCC may then adopt a decision either dismissing a case or opening formal proceedings. Once proceedings have been opened, interested parties will have the right to access the file. The CD may carry out two types of investigatory acts: inspections at the undertaking’s premises, means of transport or in the private homes of the companies’ managers and staff (with consent or judicial authorisation); and requests for information directed at any natural or legal person. If an undertaking fails to comply with its obligation to submit to an inspection, it may be subject to a fine of up to 1 per cent of its total turnover in the immediately preceding business year. Companies are also obliged to reply to requests for information, under threat of PPPs of up to €12,000 per day. All acts and decisions adopted by the CD may be subject to appeal before the CNMCC if they breach the parties’ rights of defence or give rise to irreparable damage. Subsequently, the CD may issue a statement of objections. Interested parties have 15 days to reply to it and to submit relevant evidence. After carrying out all necessary investigatory acts, the CD may propose a draft decision, and interested parties may submit allegations and request that an oral hearing be held before the CNMCC. This puts an end to the first phase of the proceedings and marks the beginning of the second phase before the CNMCC. The CNMCC may order the production of evidence as well as complementary measures to clarify certain issues. It may also hold a hearing upon request of the parties. The CNMCC then issues its final decision, which may be challenged within two months before the High Court of Spain (AN), which exercises full judicial review and may adopt interim measures such as, for instance, the suspension of the decision. The adoption of interim measures, regulated in the Law on Contentious Administrative Jurisdiction,75 may be requested at any stage of the judicial proceedings. These measures may remain in force until a final non-appealable judgment is issued. As to the timing of proceedings, while the duration of the preliminary investigation is not subject to a statutory limit, formal proceedings may not last more than 18 months and the first phase may last no longer than 12 months. Concerning international cooperation, it suffices to note that the NMCC and the courts are subject both to Chapter IV of Regulation 1/2003 on cooperation as well as to the Commission Notice on cooperation within the Network of Competition Authorities and the Commission Notice on the cooperation between the Commission and the courts of the EU Member States. Although the LDC empowers the NMCC to issue findings of inapplicability with regard to conduct a priori falling under Article 2 of the LDC, these powers may only be exercised ex officio and where the public interest so requires. Finally, it is noteworthy that there are reasonable prospects for successfully appealing NMCC decisions before the Spanish courts. As an example, in July 2015, the AN annulled the NMCC’s margin squeeze decision in Correos 2.77 In Correos 2, the NMCC concluded that Correos, the Spanish public postal services operator and owner of the public postal network, had abused its dominant position by squeezing the margins of its competitors, thereby preventing them from providing postal services to a specific category of customers, that is, to ‘large customers’ whose yearly budget for postal services exceeds €100,000. Citing recent case law of the EU courts, such as Post Danmark, the AN concluded that Correos could not be held to have breached Article 2 of the LDC or Article 102 of the TFEU, because the NMCC had not demonstrated that Correos’ conduct had actually or potentially excluded its competitors from the market. The AN stressed that a finding of illegal margin squeeze requires proof of actual or at least potential exclusionary anticompetitive effects. Additionally, in September 2017, the AN annulled the NMCC’s decision in Mensajes Cortos, in which the NMCC imposed fines on Telefónica, Vodafone and Orange totalling approximately €120 million for excessive pricing in relation to SMS and MMS termination services.78 The AN concluded that the NMCC had not demonstrated that the three companies held a dominant position in the wholesale SMS and MMS termination services markets for each of their respective networks. The AN noted, in particular, that the NMCC’s market definition was based primarily on a report of CMT, the Spanish telecommunications authority, and that the NMCC had failed to carry out an ex novo analysis of the relevant markets based on updated economic data. The AN also outlined a series of inconsistencies in the NMCC’s assessment of dominance, and concluded that the NMCC had failed to assess the relevance of countervailing buyer power. The new Title VI (Articles 71 to 81) of the LDC, in force since May 2017, transposes Directive 2014/104/EU into Spanish law.83 Article 71 of the LDC establishes that undertakings that have infringed Article 2 of the LDC or Article 102 of the TFEU are responsible for damages. Article 71(2)(b) extends the doctrine of parental liability to private damages actions, and Article 73 clarifies that when two or more undertakings infringe competition law through joint behaviour, they are jointly and severally liable for the harm caused. Article 72 of the LDC establishes that any victim of an infringement of Article 2 of the LDC or Article 102 of the TFEU has the right to claim full compensation for the harm caused before the civil courts, including for actual loss (damnum emergens) and for loss of profit (lucrum cessans), as well as interest. Articles 72 and 78 clarify that the right to obtain full compensation may not lead to overcompensation, whether by means of punitive, multiple or other types of damages, and that a victim’s compensation for actual loss must not exceed the overcharge borne by such victim. The burden of proof for the quantification of harm is on the plaintiff, who must bring an action for damages within a five-year period. Article 75 of the LDC establishes that a finding of a competition law infringement made in a final NMCC decision or judgment of the Spanish courts constitutes irrefutable evidence of an infringement for the purposes of an action for damages before the Spanish courts. If the national competition authority or the courts of another EU Member State have found a competition law infringement, there is a iuris tantum presumption that there has been an infringement for the purposes of an action for damages before the Spanish courts. Finally, Articles 77 and 81 regulate the effects of consensual dispute resolution. In 2013, the Spanish authorities merged a number of regulatory authorities, including the former National Competition Commission, into a single institution, the NMCC. The aim of this institutional reform was, primarily, to maximise economies of scale, attain synergies and reduce public expenditure. 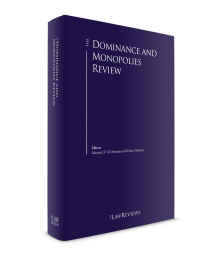 While such reform gave rise to a new institutional structure, it did not bring about any substantive changes to antitrust enforcement. In December 2016, however, a proposal was tabled in the Spanish Parliament to divide the NMCC into two independent bodies, namely the Independent Markets Regulation Authority, which would be in charge of sector-specific market regulation; and the Independent Competition Authority, which would be in charge of competition law enforcement. The aim of this proposal was to guarantee the independence of and separation between the regulatory authority and the competition authority. In March 2017, the Ministry of Economy launched a public consultation process regarding the possible division of the NMCC into two independent bodies, namely the Independent Administrative Authority for the Supervision and Regulation of the Markets, and the Independent Administrative Authority for Competition. The Ministry of Economy stated that the aim of this proposal is to adapt the institutional architecture for competition law enforcement to international best practices, to strengthen the independence of the regulatory and competition authorities, and ultimately to improve governance. At this stage, it remains unclear whether or when such a reform will take place. Additionally, in September 2017, the NMCC organised a technical workshop to discuss possible reforms of the enforcement procedure and sanctions for infringements of Articles 2 of the LDC and 102 of the TFEU (e.g., the possibility to qualify the obstruction of NMCC inspections as a serious – as opposed to a minor – infringement). 1 Francisco Enrique González-Díaz is a partner and Ben Holles de Peyer is an international attorney at Cleary Gottlieb Steen & Hamilton LLP. 2 Law 15/2007, 3 July. 3 Royal Decree 261/2008, 22 February. 4 Throughout this chapter, ‘NMCC’ refers to both the National Markets and Competition Commission and the now defunct National Competition Commission. 5 6 February 2009. In 2015, the Supreme Court of Spain (TS) handed down a judgment setting out a new interpretation of Article 63(1) of the LDC on sanctions. The NMCC has announced that it will issue a new communication on the quantification of sanctions in accordance with such interpretation. 7 For a list of situations in which state action is not subject to antitrust law, See Lillo, C, ‘La normativa de competencia: su aplicación a la Administración Pública’, Gaceta Jurídica de la Unión Europea y de la Competencia, July–August 2011, No. 22, pp. 27–28. See also: González-Díaz, F E, ‘Algunas reflexiones sobre las recientes Sentencias del Tribunal de Justicia en los asuntos Ladbroke y Comisión contra Italia’, Gaceta Jurídica de la Unión Europea y de la Competencia, April–May 1999, No. 200. 8 Case S/0167/09, Productores de Uva y Vinos de Jerez, 6 October 2011. See Navarro, E, Rambal, M, ‘La aplicación de las normas de defensa de la competencia a las Administraciones Públicas que no actúan como operadores económicos en el Mercado’, Gaceta Jurídica de la Unión Europea y de la Competencia, January–February 2013, No. 31. 9 Case S/DC/0511/14, Renfe Operadora, 28 February 2017. 10 Case S/DC/0557/15, Nokia, 8 June 2017. 11 Case S/DC/0580/16, Criadores de Caballos 2, 21 November 2017. 12 Case S/DC/0540/14, Istobal, 30 June 2016. 13 Case S/0500/13, AGEDI/AIE Radio, 26 November 2015. 14 In 2014, the NMCC adopted the following fining decisions for abuse of a dominant position: Correos 2 (case S/0373/11 on margin squeeze), Endesa Instalación (case S/0446/12 on excessive pricing), Criadores de Caballos (case S/0345/11 on leveraging) and SGAE-Conciertos (case S/0460/13 on excessive pricing). 15 In 2013, the NMCC adopted the following fining decisions for abuse of a dominant position: Correos (case S/0341/11 on refusal to deal), AGEDI (case S/0360/11 on unfair, non-transparent and discriminatory management of intellectual property rights) and Tanatorios Coslada (case SAMAD/12/10 on refusal to deal). 16 Case S/0207/09, Transporte Televisión, 8 February 2012. 17 Case S/0211/09, Endesa Instalación, 21 February 2012. 18 Case S/0248/10, Mensajes Cortos, 19 December 2012. 19 See, for example, case 677/05, Distribuidoras Prensa Ciudad Real, 24 April 2006, p. 10. 20 See, for example, Mensajes Cortos, above, pp. 129–139. 21 See, for example, case 441/98, Electra Avellana, 7 July 1999, p. 9. 22 See, for example, case S/0157/09, EGEDA, 2 March 2012, p. 52; case S/0220/10, SGAE, 3 July 2012, p. 37; Correos, above, p. 20; AGEDI, above, p. 41; AGEDI/AIE Radio, above, p. 48; Criadores de Caballos 2, above, p. 35. 23 Case R 362/99, Bacardí, 30 September 1999, p. 8. 24 Case 486/00, McLane/Tabacalera, 24 April 2002, pp. 20–21. 25 See, inter alia: case 427/9, Electra Caldense, 19 February 1999, pp. 9–10; case 535/07, Fonogramas, 9 December 2008, p. 24; Mensajes Cortos, above, pp. 155–165; case S/DC/0602/16, Can Pack contra Ball, Remax y Crown, 21 December 2017, pp. 19–20. 26 See González-Díaz, F E, Temple Lang, J, ‘Chapter 3. The Concept of Abuse’, in: González-Díaz, F E, Snelders, R, EU Competition Law Volume V. Abuse of Dominance Under Article 102 TFEU (Claeys & Casteels: Daventer, 2013), pp. 115–158. 27 Case 456/99, Retevisión/Telefónica, 8 March 2000, p. 28. 28 TS judgment in appeal 4495/1998, 8 May 2003, point of law 7. 29 SGAE, above, p. 37. 30 See, for example, case S/0003/07, E.On, 8 November 2011, p. 34; SGAE-Conciertos, above, pp. 30–31; Criadores de Caballos, above, pp. 28, 30, 32, 39, 41, 49, 59 and 61; Criadores de Caballos 2, above, p. 36. See also TS judgment in appeal 3042/2008, 10 February 2011, point of law 6. 31 TS judgment in appeal 4495/1998, above, point of law 7. 32 Retevisión/Telefónica, above, p. 28. 33 See, for example, Retevisión/Telefónica, above, p. 29. 34 Case 464/99, Aseguradoras Médicas Vizcaya, 6 July 2000, p. 17. 35 TS judgment in appeal 9174/2003, 20 June 2006, point of law 8. 36 Gutiérrez, A, ‘Artículo 2. Abuso de posición dominante’, in: Massaguer, J, Folguera, J, Sala Arquer, J M, Gutiérrez, A, Comentario a la Ley de Defensa de la Competencia (Civitas: Pamplona, 2010), pp. 203–204. See also González-Díaz, F E, Temple Lang, J, ‘Chapter 3. The Concept of Abuse’, in: González-Díaz, F E, Snelders, R, EU Competition Law Volume V. Abuse of Dominance Under Article 102 TFEU (Claeys & Casteels: Daventer, 2013), pp. 154–156. 37 Dorronsoro, C, ‘Artículo 2. Abuso de posición dominante’, in: Odriozola, M, Irissarry, B, Derecho español de la competencia: Comentarios a la Ley 15/2007, Real Decreto 261/2008 y Ley 1/2002 (Bosch: Barcelona, 2008), pp. 149–150. See also: González-Díaz, F E, Temple Lang, J, ‘Chapter 3. The Concept of Abuse’, in: González-Díaz, F E, Snelders, R, EU Competition Law Volume V. Abuse of Dominance Under Article 102 TFEU (Claeys & Casteels: Daventer, 2013), pp. 154–156. 38 See, for example, Transporte Televisión, above, pp. 135–139; case S/0391/11, Llamadas Móviles, 6 March 2014, pp. 65–68; AGEDI/AIE Radio, above, pp. 73–76; Nokia, above, pp. 48–52. 39 See Ortiz, L, Ibáñez, P, ‘Evolving priorities and rising standards: Spanish law on abuses of market power in the light of the 2008 Guidance Paper on Article 82 EC’, in: Pace, LF, European Competition Law: The Impact of the Commission’s Guidance on Article 102 (Edward Elgar: Cheltenham, 2011), pp. 90–94. 40 See, for example, Transporte Televisión, above, pp. 77–92 and 118–135. 41 TS judgment in appeal 915/2002, 13 December 2004, point of law 7. 43 Llamadas Móviles, above, p. 66; Correos 2, above, pp. 30, 31 and 36; case S/0409/12, Telefónica, 29 October 2015, pp. 6–7. 44 Llamadas Móviles, above, pp. 65–68. 45 See González-Díaz, F E, Padilla, J, ‘Chapter 5. Margin Squeeze’, in González-Díaz, F E, Snelders, R, EU Competition Law Volume V. ‘Abuse of Dominance Under Article 102 TFEU’ (Claeys & Casteels: Daventer, 2013), pp. 229–317. 46 Nokia, above, pp. ۴۴–۵۲. 47 Case 514/01, Iberia, 1 April 2002. 48 TS judgment in appeal 4699/2003, 4 April 2006. 49 Case 413/97, Airtel/Telefónica, 26 February 1999, p. 40. 50 Gutiérrez, above, pp. 205–206. 51 Case 412/97, BT/Telefónica, 21 January 1999. 52 Endesa Instalación, above, pp. 40–48. 53 See similarly case S/0089/08, Unión Fenosa Instalación, 20 September 2011; case 2795/07, Hidrocantábrico Instalación, 20 September 2011; E.On, above. 54 Gutiérrez, above, p. 184. 55 McLane/Tabacalera, above, p. 25. 56 Case 517/01, Iasist/3M, 5 April 2002. 57 Correos, above, pp. 21–36. 58 Case S/0153/09, Mediapro, 17 March 2011. 59 Renfe Operadora, above, pp. 64–68. 60 See case 2785/07, AIE, 23 February 2011; case S/0297/10, AGEDI/AIE, 14 June 2012; SGAE, above; AGEDI, above; AGEDI/AIE Radio, above. 62 It has been argued that both the sheer number of abuse of a dominant position infringement decisions adopted by the Spanish authorities (nearly three times more than the Commission from 1992 to 2009) and the large proportion of exploitative abuses cases (34 out of 74) reflect the fact that Spanish abuse of a dominant position enforcement may be at a different stage of development from that of Commission Article 102 of the TFEU enforcement. See Ortiz, Ibáñez, above, pp. 85–87. 63 Mensajes Cortos, above. The NMCC imposed a fine of €119.96 million on Telefónica, Vodafone and Orange. 64 Endesa Instalación, above, p. 51. 65 EGEDA, above, pp. 41–44 and 55–60; SGAE-Conciertos, above, pp. 17–18 and 22–26. 66 EGEDA, above, pp. 41–44 and 55–60. 67 Mensajes Cortos, above, pp. 141–154. 68 Endesa Instalación, above, pp. 25–26. 69 See also, for example, case S/0501/13, Continental Automotive, 15 October 2015, p. 31. 70 SGAE-Conciertos, above, pp. 17–18 and 22–26. 71 SGAE-Conciertos, above, pp. 25–26. 72 SGAE, above, p. 49. 73 AIE, above, p. 42–43. 74 Correos, above, p. 41. 75 Law 29/1998, 13 July, Articles 129–136. 76 The NMCC has adopted several commitments decisions in Article 2 of the LDC or Article 102 of the TFEU cases in recent years. For instance, in Estudios de Mercado Industria Farmacéutica, the NMCC investigated whether ‘multiple supply’ clauses contained in some of IMS’ contracts with wholesale pharmaceutical distributors for the purchase of sales data were exclusionary and gave rise to abuse of a dominant position. Pursuant to these clauses, if a distributor decided to supply sales data to competitors of IMS, (1) IMS had to be notified in advance, (2) IMS could terminate its contract with the distributor, and, in cases where IMS were not to terminate its contract with the distributor, (3) the amounts paid by IMS to the distributor would be reduced by 40 or 60 per cent depending on the number of competitors the data was sold to (price reduction clause), and (4) the terms and conditions of supply to IMS could not be less favourable than those offered to IMS’ competitors (‘most favoured customer clause’). The NMCC terminated the proceedings after IMS committed to eliminate clauses (1), (2) and (4) from its current and future contracts, and not to increase the percentages of the price reduction clause. See case S/DC/0567/15, Estudios de Mercado Industria Farmacéutica, 13 July 2017, pp. 10–11 and 31–33. 77 AN judgment in appeal 118/2014, 1 July 2015. This judgment was confirmed by the TS on 5 February 2018 (see TS judgment in appeal 2808/2015). 78 AN judgments in appeals 36/2013 (1 September 2017), 40/2013 (1 September 2017) and 41/2013 (4 September 2017). 79 See Ordóñez, D, ‘La reclamación ante los tribunales españoles de los daños sufridos en violación del Derecho europeo de la competencia’, Gaceta Jurídica de la Unión Europea y de la Competencia, January–February 2011, No. 19, p. 21. 80 Law 1/2000, 7 January. 81 Fernández, C, ‘Diez años de la aplicación privada del Derecho comunitario de la competencia en España’, Gaceta Jurídica de la Unión Europea y de la Competencia, September–October 2012, No. 29, pp. 13–14. 82 Rodríguez-Sastre, I, ‘Disposición adicional primera’, in: Odriozola, Irissarry, above, p. 1196. 83 See Brokelmann, H, ‘La Directiva de daños y su transposición en España’, Revista General de Derecho Europeo, No. 37, 2015, and Gascón Inchausti, F, ‘Aspectos procesales de las acciones de daños derivados de infracciones de las normas sobre defensa de la competencia: apuntes a la luz de la Directiva 2014/104 y de la Propuesta de Ley de transposición’, Cuadernos de Derecho Transnacional, Vol. 9, No. 1, 2017. 84 See Plan de Actuación 2018 de la Comisión Nacional de los Mercados y la Competencia, 7 March 2018, pp. 12–13.